This is a beta version of the HDR Data Tools which is still undergoing final testing 2012 preschool statistics its official release. Your help in this regard is greatly appreciated. Enter the terms you wish to search for. The State of Preschool 2016 is the latest edition of our annual yearbook report profiling state-funded prekindergarten programs in the United States. NIEER’s State Preschool Yearbook is the only national report on state-funded preschool programs with detailed information on enrollment, funding, teacher qualifications, and other policies related to quality, such as the presence of a qualified teacher and assistant, small class size, and low teacher-to-student ratio. This Yearbook presents data on state-funded preschool during the 2015-2016 school year and documents more than a decade of change in state preschool since the first Yearbook collected data on the 2001-2002 school year. The 2016 Yearbook profiles state-funded preschool programs in 43 states, plus Guam and the District of Columbia and provides narrative information on early education efforts in states and the U. Nationwide, state-funded preschool program enrollment reached an all-time high, serving nearly 1. 5 million children, 32 percent of 4-year-olds and 5 percent of 3-year-olds. 4,976, exceeding pre-recession levels for the first time. Six state funded preschool programs met all 10 current quality standards benchmarks. 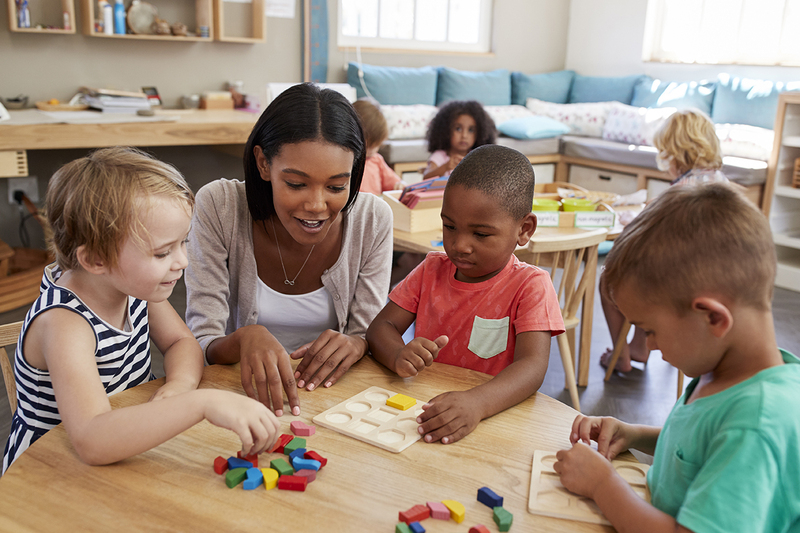 Current benchmarks were designed to help states build programs, focusing on resources and policies related to the structural aspects of public preschool—elements needed for a high-quality program but not fully defining one. This year, NIEER is introducing major revisions to the policy benchmarks for the first time since the Yearbook was launched. The new benchmarks raise the bar by focusing on policies that more directly support continuous improvement of classroom quality. The 2016 Yearbook is organized into three major sections. The first section offers a summary of the data and describes national trends in enrollment, quality standards, and spending for state-funded preschool. It also details the changes made to create our new benchmarks. The second section presents detailed profiles outlining each state’s policies with respect to preschool access, quality standards, and resources for the 2015-2016 year. Yearbook Contents The links below open PDF documents. For assistance with PDF, see the special instructions for viewing the Yearbook PDF. What Qualifies as a State Preschool Program? State Profiles Click a state below to view its profile as a PDF document. The State of Preschool 2016: State Preschool Yearbook. New Brunswick, NJ: National Institute for Early Education Research. A unit of Rutgers, The State University of New Jersey. The State Preschool Yearbook is an annual publication which has tracked the funding, access, and policies of state-funded preschool programs since the 2001-2002 school year. The Yearbook seeks to improve the public’s knowledge and understanding of state efforts to expand the availability of high-quality education to young children in the 21st century. 2015 Did State Pre-k get back on track in 2015? 2013 Pre-k after the recession: stalled or turning up? A unit of Rutgers, The State University of New Jersey. As early childhood education moves front and center in the public policy debate, more attention is being paid to early literacy. Literacy development starts early in life and is highly correlated with school achievement. The more limited a child’s experiences with language and literacy the more likely he or she will have difficulty learning to read. Key early literacy predictors of reading and school success include oral language, Alphabetic Code, and print knowledge. Well-conceived standards for child outcomes, curriculum content, and teacher preparation help establish clarity of purpose and a shared vision for early literacy education. Increased demands for program accountability are often heavily focused on assessments of children’s early literacy development. Highly capable teachers are required to implement today’s more challenging early literacy curriculum. Teacher knowledge, respect and support for the diversity of children’s families, cultures, and linguistic backgrounds are important in early literacy development. All children should have access to early childhood programs with strong literacy components that include clear adaptations for children with special needs. Early literacy curricula and teaching practices should be evidence-based, integrated with all domains of learning, and understandable to staff members. Early literacy standards should be established that articulate with K-12 programs and reflect consistency and continuity with overall program goals.